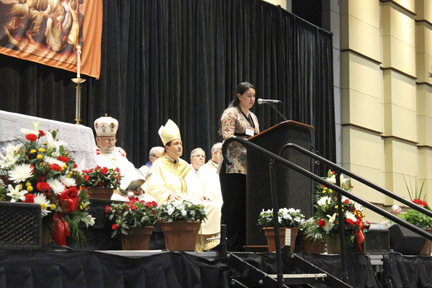 Kathia Arango, coordinator of the diocese’s Hispanic Catholic Charismatic Renewal and one of the speakers at the conference, proclaims the Word of God. Philadelphia Auxiliary Bishop John J. McIntyre and Ukrainian Archbishop Stefan Soroka concelebrated the opening Mass. Catholic Charismatics from the Diocese of Camden gathered with the national charismatic community the weekend of June 1-3 in Philadelphia, to “pray with one heart together with Mary in the Upper Room,” as the conference’s theme suggested. 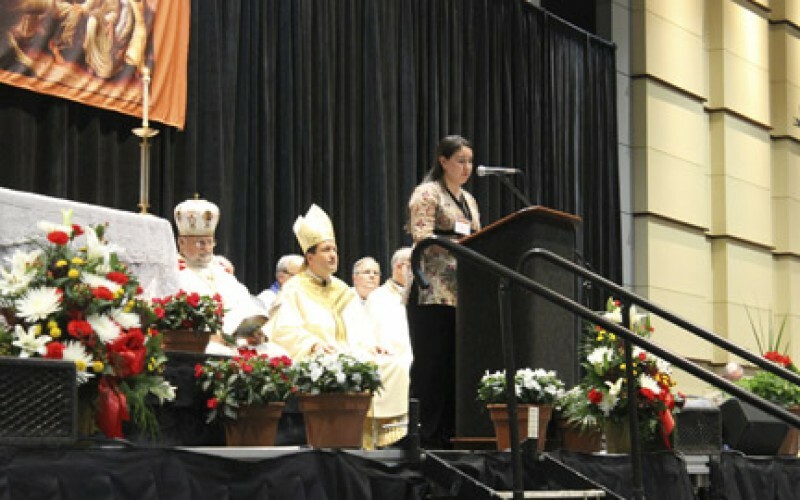 The 2012 National Catholic Charismatic Renewal Conference took place at the Pennsylvania Convention Center, with 2,500 English, Filipino, Haitian and Hispanic Catholics in attendance. To reflect this diversity, the languages of English, Creole and Spanish were utilized in the conference. Held every five years, the weekend in June marked the 45th anniversary of the World-Wide Catholic Charismatic Renewal. The conference was organized by the National Leadership Groups of the Catholic Charismatic Renewal: the Alliance of Filipino Catholic Charismatic Prayer Communities, Association of Diocesan Liaisons to the Catholic Charismatic Renewal, the Catholic Fraternity of Charismatic Covenant Communities and Fellowships, Comité Nacional de Servicio Hispano, and Le Conseil du Renouveau Charismatique Catholique des Haitiens d’Outre-Mer. Notable conference speakers included Michelle Moran from England, president of ICCRS (the International Council for the Catholic Charismatic Renewal); and Msgr. Joseph Malagreca, coordinator of the Charismatic Renewal in the Diocese of Brooklyn, N.Y., and spiritual director for both the Hispanic and Haitian National committees.